Camp Virginia: I’m talking with Barb Stachurski today. She’s the General Manager at the Virginia Beach KOA in Virginia. How’s it going this morning, Barb? Barb Stachurski: Good, thank you. Camp Virginia: So, how long has that particular campground been there? Has it always been a KOA? Barb Stachurski: It was a private campground decades ago. It became a KOA at some point in history. I’m not really sure when. In 2007, the Campgrounds of America, the corporate office, purchased it and it has been running it ever since. So, my husband and I are the general managers. Camp Virginia: Okay. And what types of camping do you guys offer there? Is it tent all the way up to RV? Barb Stachurski: And beyond. We have tent camping. We have sites for small RVs and campers, like pop-ups and such. We have big sites for the big rigs up to 50amp. You know, 40 and 45 feet and more. And then we also have a couple of things that are unique in Virginia Beach. We have basic camping cabins they’re called. They’re sort of rustic. And then we also have deluxe cabins, which nobody in the area has, and I can tell you more about them when you get to that. Camp Virginia: Yeah. Yeah, tell me more about those. Barb Stachurski: Okay. Well, deluxe cabins look a little bit like a log cabin, but they are not obviously manufactured, but they contain all the amenities that a hotel would have, but a lot more. So, there are real beds and they’re super comfortable. We have really top-of-the-line mattresses. All the linens are provided. There is always at least a private bedroom with perhaps a set of bunks or two sets of bunk-beds, and then maybe another room depending on the size. There is kitchenette, such as microwave. There’s a refrigerator. Some of them even have a stovetop. And they all have bathrooms. Full bathrooms. Camp Virginia: Wow, that sounds like the kind of place I could do a long-term stay in. Barb Stachurski: We actually don’t do long-term stays in them, just because they’re not built for long-term use. They’re built for the vocational. Barb Stachurski: So, you know, they’re good for a week or two, but they rival any oceanfront hotel in terms of quality and yet you get all the amenities of the campground. So, it’s for the people who like the idea of camping, but have no desire to be in a tent or a camper. Barb Stachurski:So, it’s best of both worlds. Camp Virginia: Oh, okay. Now, what are the most popular activities for the guests there? I see you have a massive pool. That looks pretty fun. Barb Stachurski: And actually, the pictures a little bit deceiving. It’s actually two swimming pools right next to each other. Barb Stachurski: So, one of them has slides. It has water slides, and kids love that, and then the second pool is huge and it’s great for families or for laps. You know, it’s just more spacious. So, those are open Memorial Day through Labor Day. Sometimes a little bit later if it’s nice out and we can keep it going, but generally, Memorial Day through Labor Day. So, those are the big highlights and we work really hard at keeping them nice and clean. The other big attraction we have is a giant – it’s called the Big Bouncer. Do you remember the moon bouncers of years ago that we used to have? Barb Stachurski: Yeah, it’s sort of like that. 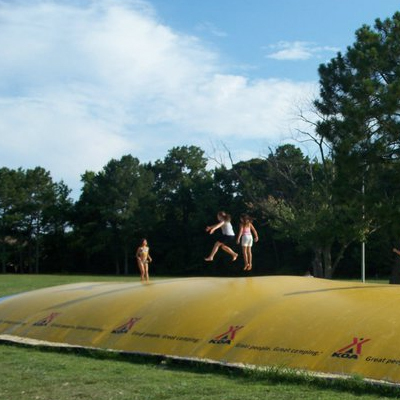 It’s enormous and everybody loves it, from little kids up to older folks. It’s mainly for kids obviously, and you can just jump to your heart’s content, and they love that. Camp Virginia: Fun. So, what are some of the attractions in the area that you generally recommend guests check out if they ask? Barb Stachurski: Sure. Well, most people come to Virginia Beach for the oceanfront. It’s world famous. The boardwalk is a three-mile stretch of concreted boardwalk in between the hotels and the oceanfront. And this oceanfront in Virginia Beach is gorgeous. It’s definitely beautiful, and so obviously it gets many, many visitors throughout the year. Obviously primarily summer, but the water is wonderful. It does not have a rough surf usually. It’s blue and clean, and people just love it. So, we get lots and lots of families. A lot of people from Canada come down as well. Barb Stachurski: Adults from all over. So, the oceanfront and the boardwalk is the big attraction, but there’s all kinds of things to do in the area. We are in what’s considered the resort area, so we’re very close to all of these things. We’re 2.2 miles from the oceanfront. And in the summer, the city trolley comes right into our campground, picks everybody up, and takes them right down to the beach, so they don’t have to do parking or driving. Barb Stachurski: It’s very cool. It’s cheap. It’s two bucks a person for the day. Camp Virginia: Oh, that’s nothing. Barb Stachurski: Right. So, they can load up their bikes if they have them. They can load up their chairs and their umbrellas, their coolers, and head down to the beach. Come back in the forest, and it’s really, really ideal. Camp Virginia: Okay, cool. Two more questions for you, Barb. 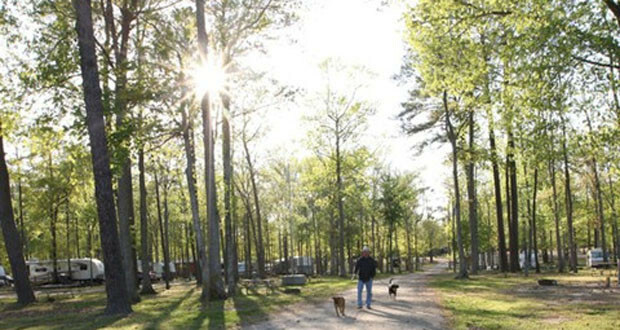 If you were going to spend just one hour in the Virginia Beach KOA Campground there, how would you spend your time? Barb Stachurski: Well, I’d say I wouldn’t be camping there, so if I were just staying an hour, I would probably go swimming. Camp Virginia: Nice. Yeah, those pools look fantastic. They’re larger than I’ve seen at any other KOA for certain, and definitely probably most of the private campgrounds we’ve talked to. We have interviewed several KOAs, but those look just like a blast. Barb Stachurski: Yeah, you know, they are actually bigger than normal, now that I think about. So, whoever built those had the foresight to do that. Camp Virginia: Yeah, absolutely. It’s a big draw, and I would imagine that a lot of people that visit that site, or maybe if they’re comparing it to other places; and I think once you see those pictures of those pools on your site, that probably sways the decision heavily. And last question for you: if you were going to spend just one night at the Virginia Beach KOA there, which specific site would you pick? Barb Stachurski: Personally, I would take a deluxe cabin. I would take a deluxe cabin. Camp Virginia: Oh, okay, they look great on the site. Now, is that common for the KOAs? Are they starting to get into that or is that something that you guys have just implemented there? Barb Stachurski: No, all the company-owned KOAs have them and I would guess that probably most of the KOAs that are individually owned have at least a couple, if not several. They’re growing in trend. I mean we can hardly – you know, we book them all the time, even throughout the year. Like we don’t really have enough for the demand. Camp Virginia: Cool. And you know, it’s interesting. It kind of ties into the recent trend with glamping. It would be one step above that, but glamping, as I’m sure you know, is where you have a very nice canvased tent and the lush queen bed inside. Camp Virginia: So this is just a step above that, but it still feels like camping. Barb Stachurski: Right, so it’s perfect, especially for people who just don’t want to deal with all that. It’s comfort and convenience. Camp Virginia: Very cool. 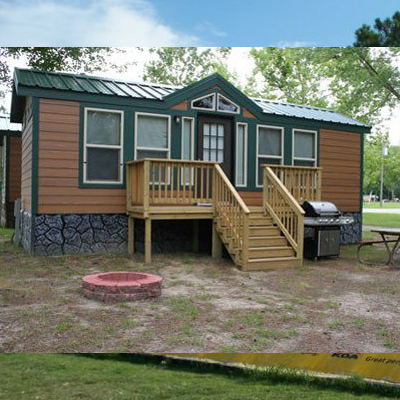 Well, thank you so much for taking some time out of your day, Barb, to chat with us about the Virginia Beach KOA in Virginia. Barb Stachurski: No problem. Thank you for your time. I appreciate it. Camp Virginia: All right, take care. Barb Stachurski: Okay, thanks, bye-bye.